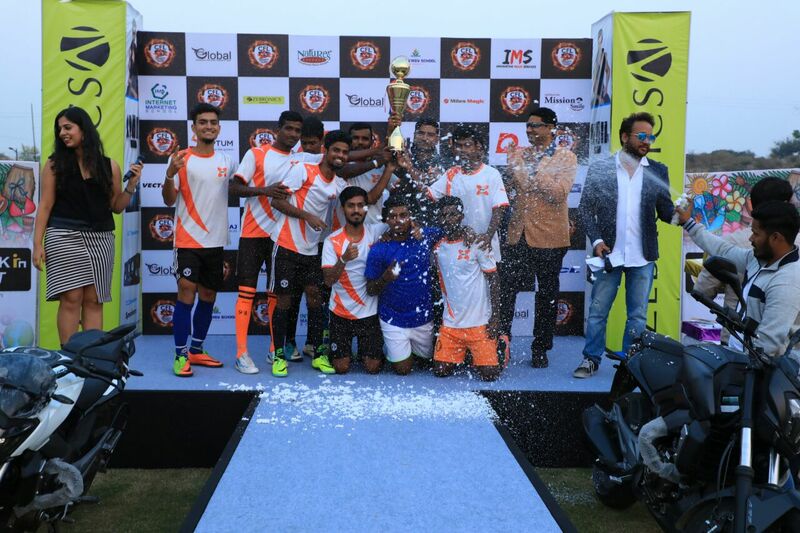 Gurugram: Corporate Football League, one of the biggest football leagues for corporates in India, has announced ‘PPTS’ as the winner of its second season at the MADE EASY school, Gurugram where the two days event was conducted at its 9 acres huge playground. Mr. B Singh, Chairman & MD, MADE EASY Group was the Chief Guest of the event. The winning team was bestowed with a Gold Plated Trophy by Ms. Jyoti Singh, MD, MADE EASY Group; INR 11000/- by Mr. Rahul Singhania, MD, Innovative Media Services (IMS) and gifts worth INR 50,000/- by Mr. Kunal Mittal, MD, KM Global. In its second season, CFL saw an active participation of 500 people including 20 football teams conspiring players from some of the biggest corporates houses and making it the biggest football league ever being played in a school by the corporates. The companies who attended the event are PwC, Indiabulls, SF Sonic, Samsung, F.I.S, Panasonic, Godrej Properties, Bank of America, Kartrocket, MADE EASY, Cheil, Miles Magic, PNB MetLife, Fab Expo, ICICI Bank, Olympus, PPTS, Deutche Bank, Value First & HCL. The two day event saw League matches on the 25th November 2017 and Knockout match including Quarter finals, semi-finals and finals on the 26th November 2017 which saw a footfall of close to 500 people including participants. Along with the high voltage sporting event, the CFL CARNIVAL was also organized side-by-side at the venue – MADE EASY School ground, during the two days tournament where kids and family members spent their weekend amid –“fun, food and masti” while cheering the teams! The first season of the league was a 15 days long event that took place at The Tyagraj Stadium in 2014. Anglian Holdings was the winner of the event which saw a participation of 32 teams. Previous articleIndia’s largest Career Fair for Young Adults to be held on December 1st!